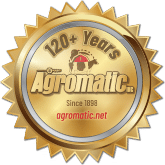 Agromatic Inc. began more than 110 years ago in 1898 as Klinzing Manufacturing in St. Cloud, WI. August F. Klinzing was the founder. He was an important innovator & inventor of early barn equipment. Mr. Klinzing earned more than 15 patents with his various inventions such as manure carriers, stanchions, cow drinking cups, and barn cleaners. In more recent times the company has taken the trade name "Agromatic" and has been run as a division of the A.F Klinzing Co. which was owned and managed by Dave Hoppman. Mr Hoppman owned and managed Agromatic for more than 38 years. In 2010, Agromatic was purchased by a long time employee, Dean Birschbach. Dean started out as Shipping Manager and worked most recently as a Territory Sales Manager in Eastern Wisconsin. The company is now known as Agromatic, Inc.
Agromatic's headquarters are in Fond du Lac, WI, but we have dealers throughout the USA & Canada. Agromatic strives to supply farmers with high quality equipment at an affordable price.